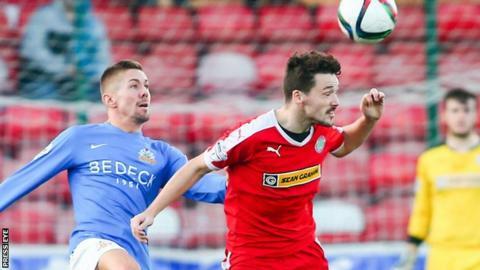 Cliftonville lost ground on the Premiership top two after drawing with Glenavon at Solitude. Andy Hall's audacious long-range free-kick hit the Reds bar while Tomas Cosgrove headed wide for the hosts. Cliftonville pressed after the interval and Chris Curran's composed finish put the Reds ahead before David McDaid wasted a chance to double the lead. Two substitutes combined for the Glenavon equaliser, with Declan O'Brien tapping in from Joel Cooper's cross. Cliftonville slip to five points behind pacesetters Crusaders and Linfield, who both picked up three points on Saturday. Hall almost found the net with a free-kick from just inside the Reds half while the visitors had penalty claims turned down after Kevin Braniff was tugged by Levi Ives. Curran fired into the bottom corner and McDaid was denied by keeper Jonathan Tuffey when he should have netted. It was a costly miss as O'Brien slotted in and he blazed over with a chance to win it in the dying minutes.